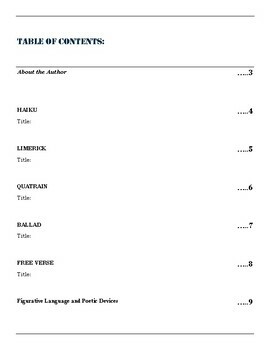 This is a packet that can be printed for students to complete for a poetry project. 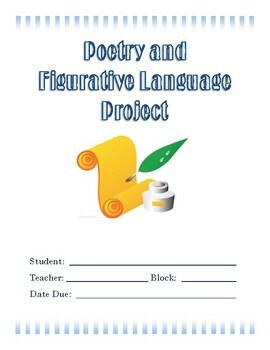 Students will write and illustrate each of the following poem types: haiku, limerick, quatrain, ballad, and free verse. Then they will identify how they used each of the following poetic elements in the poems: simile, metaphor, hyperbole, personification, idiom, onomatopoeia, rhyme, rhythm, repetition, and alliteration. One way to differentiate this assignment would be to have some students write their own poems and other students find poems that other people had written. This product can be purchased individually or as part of a bundle. 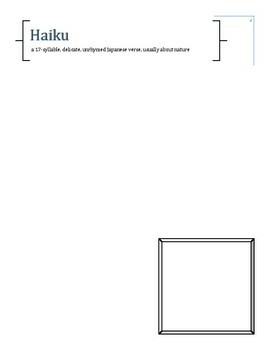 This item is a paid digital download from my Teachers-pay-Teachers store. This item is bound by U.S. and International copyright laws. 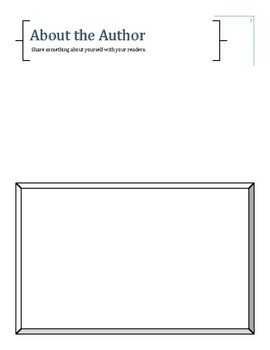 Redistributing, editing, selling, or posting this item (or any part thereof) on the internet are all strictly prohibited without prior permission from the author. Violations are subject to the penalties of the Digital Millennium Copyright Act.